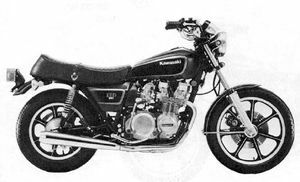 The Kawasaki KZ650E is a motorcycle produced by Kawasaki in 1980. Remarks: American sports model with mild appearance. Front single disc and rear drum brakes, c r d exhaust pipes, cast wheels, low fuel level warning light.